Scars and Marks: Al-Liby has a scar on the left side of his face. Remarks: Al-Liby recently lived in the United Kingdom, where he has political asylum. He is believed to currently be in Afghanistan. Al-Liby usually wears a full beard. 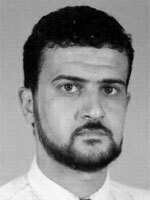 Anas Al-Liby is wanted in connection with the August 7, 1998, bombings of the United States Embassies in Dar es Salaam, Tanzania, and Nairobi, Kenya. The Rewards For Justice Program, United States Department of State, is offering a reward of up to $25 million for information leading directly to the apprehension or conviction of Anas Al-Liby.